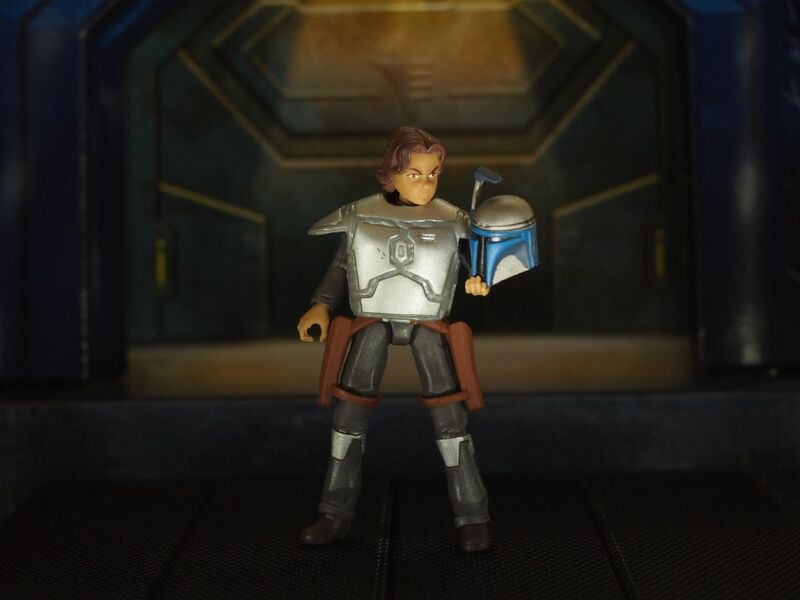 TCW Boba Fett (1:18, Hasbro) – These Are Not Toys! As this is my first actual review let me start by explaining a thing about packaging. In short: I don’t care about it. I know many reviewers start their reviews by showing the packaging but those I buy always get ripped to pieces and go straight to the trash bin, unless it’s some elaborate Japanese figure’s box handy for storing 30 spare palms, faces and accessories. Other than that: no MITB or MOC for me! I often buy figures that were already open for cheaper shipping or used ones if I manage to find rares in good shape. I only care about displaying them in a way I enjoy them and occasional photo shoots. Ok, with that out of the way let’s start the review with the picture of the packa… GOT YA! Naah, I’ll get right down to the figure. This one is for some reason disliked by many collectors. Actually I know the reason, I just can’t justify this figure not being liked or at least not being given credit where its due. Oooh, many of you probably shouted, THAT Boba Fett! Yup, that one. The kiddo. But before you leave uninterested – give him a chance. Why do you cross him out to begin with? Because he’s just a kid, you say. Ok, fair enough, he is. 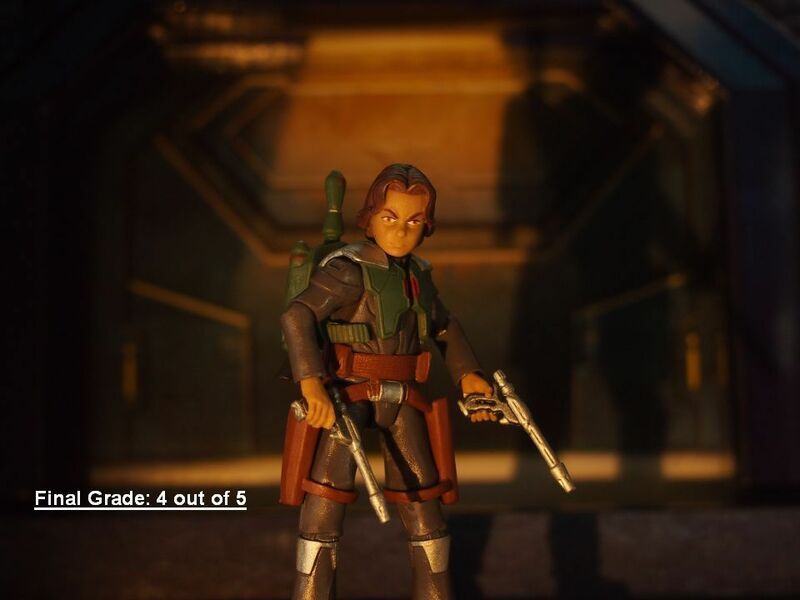 But he also is… a Mandalorian kid! 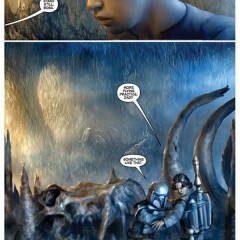 And one raised by Jango Fett himself. Remember that it was THIS guy, this very kid, who grew up to be… well, Boba Fett, the man we all fear and love. And how did he get there? We all know now that he wasn’t either speed-grew as clone troopers were and he started his rough bounty hunter life rather early. So it’s obvious that the foundations of his character and future awesomeness lie in the past, in his early teenage years. In the harsh training performed by his father. 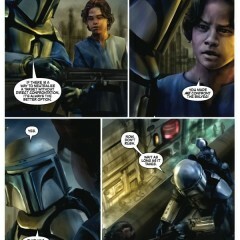 I really like that aspect of Boba’s life, part of which was described in the Blood Ties comic book that I keep referring to here in form of screenshots. And this figure really fits that image. The figure itself has an interesting design. 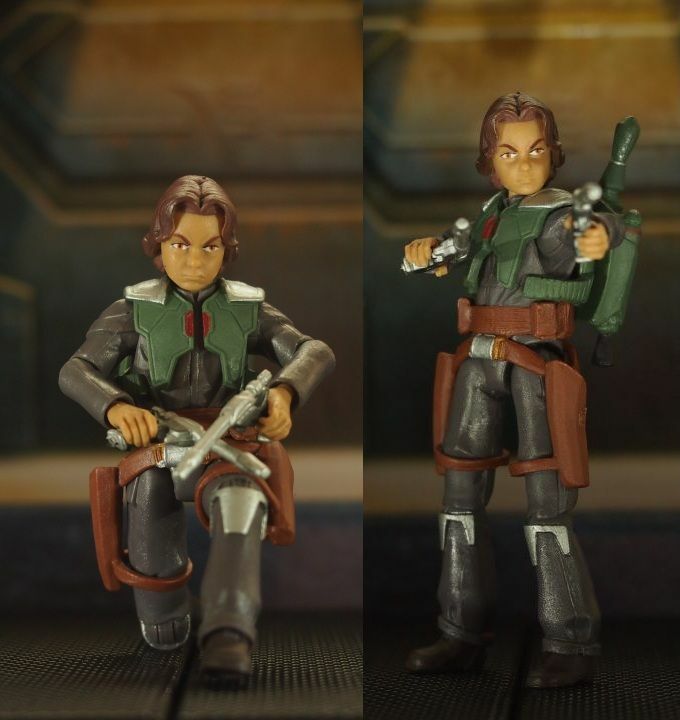 Boba’s face is based both on the image of actor Daniel Logan, who played him in Attack of the Clones and on the animated model from the Clone Wars series. The result is the mixture of both: a kid who looks mean and bitter but can also raise sympathy as a child trying hard to be tough in the cruel galaxy. He sports what seems like a part of a Mandalorian armor, namely the twin chest pieces and is packing his dad’s pistols (or ones just like them). 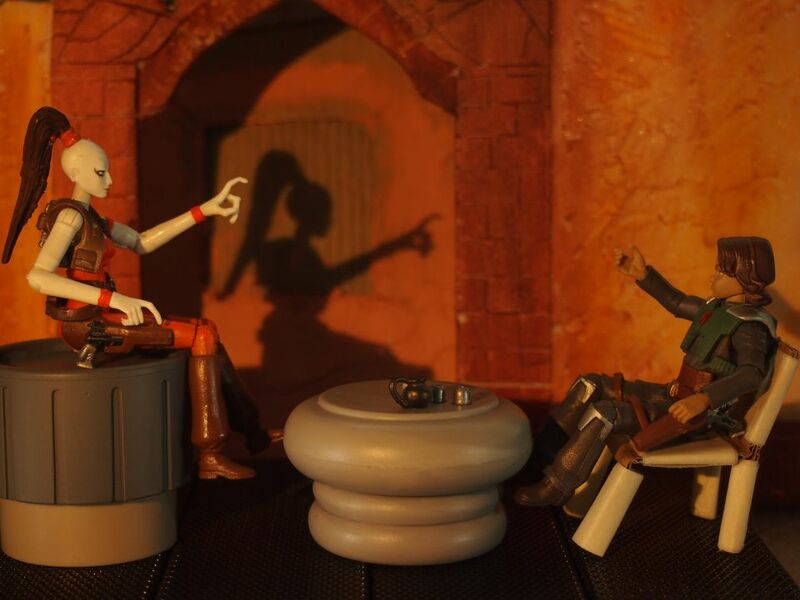 I heard people calling that both cute and ridiculous but I think it does make sense: after all Jango wanted his ‘son’ to learn the ways of Mandalorians, so why not start the teachings by making him accustomed to the tools of the trade, piece by piece? As for those who wonder why he is wearing only a part of the whole armor… you really have to ask? 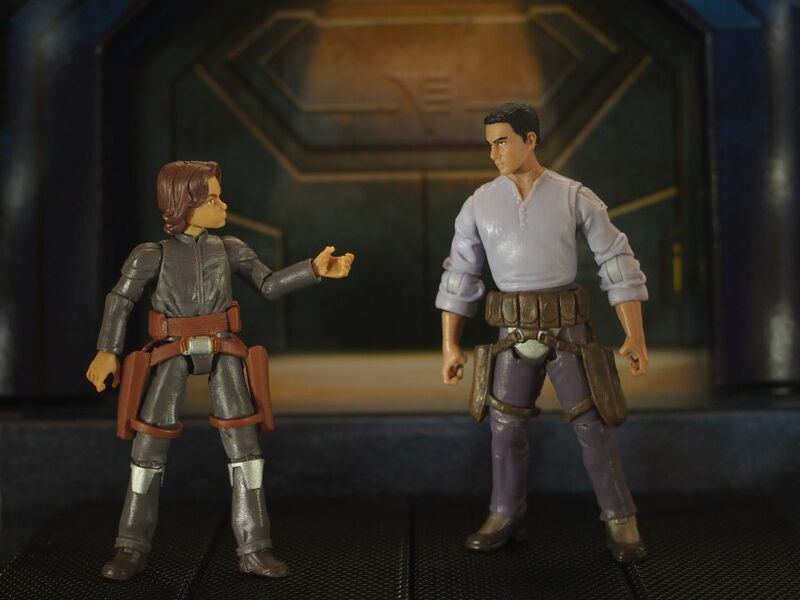 Here you can also see that a Mandalorian helmet seems in scale with him even though he sadly can’t wear it without having the hair sculpt modified. If you really hate the armor you can take it off and… the figure still looks really neat. Underneath he sports a dark grey jumpsuit with realistic details in the chest area, like wrinkles, a small collar and visible seams. 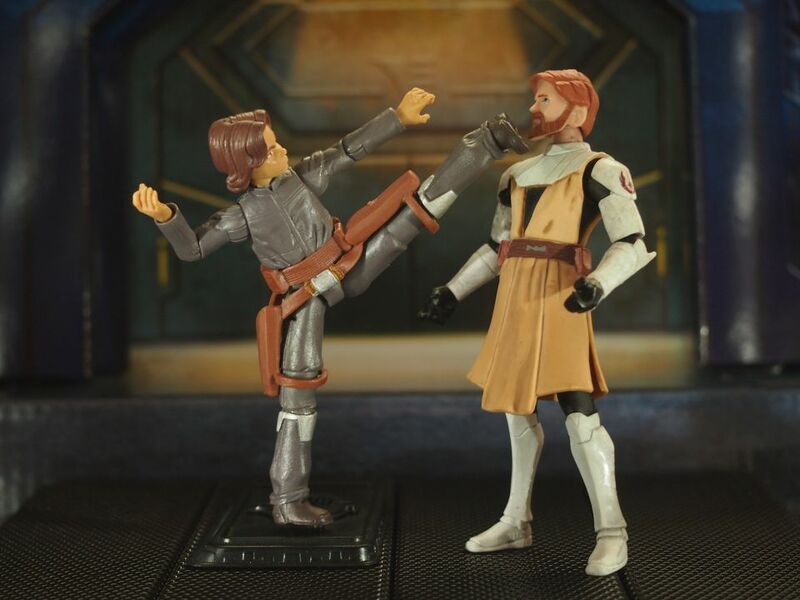 Dressed like that he fits nicely with his father not wearing the armor either which can translate to them attending a martial arms training or simply spending time together (like they did before Obi-Wan so rudely interrupted them on Kamino). I guess one could consider taking the belt off and aiming for the look of Boba posing as a Republic clone cadet in the Clone Wars series (or simply – use him as a young clone), but I haven’t found any info on the belt being completely removable (some customizers did cut the lower part off, though) and I was too afraid to destroy the figure so I haven’t tried that. I know, weak of me, sorry to disappoint. 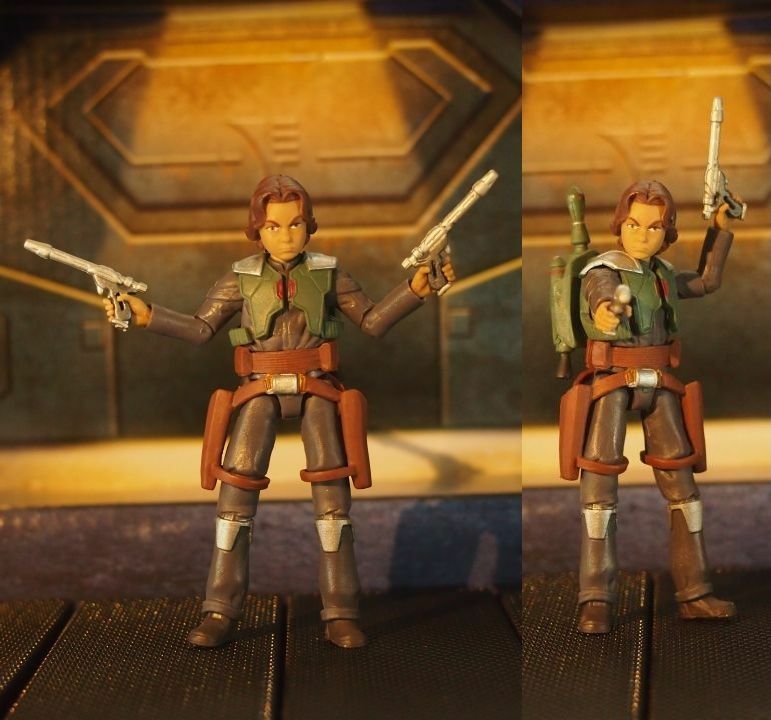 In terms of poseability Boba just rocks – he’s even got ball-hinged hips and despite small size can compete with the best Star Wars figures up-to-date. 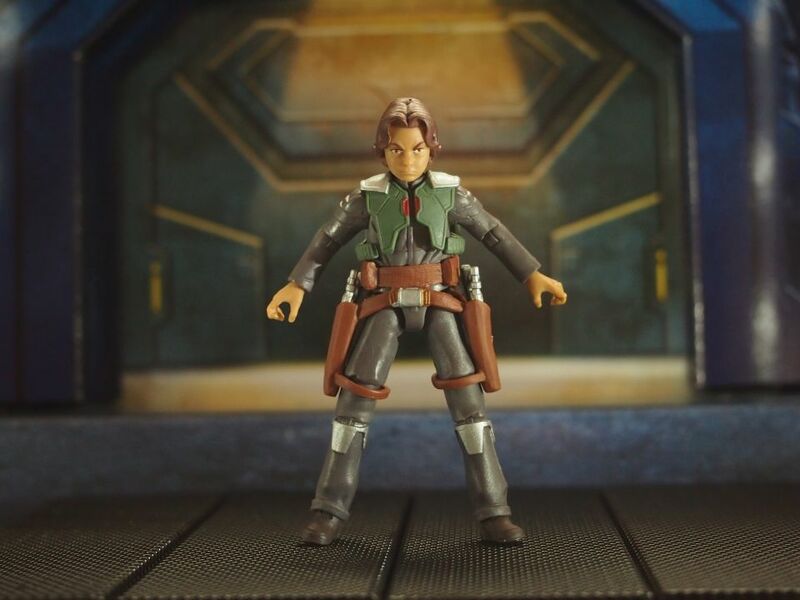 He’s got a jetpack, which is a tad smaller than his father’s, which doesn’t exactly correspond with the whole ‘using Jango’s equipment’ idea, but I don’t mind seeing how it doesn’t impede his poseability even one bit, making him perfect for action poses wearing full gear. 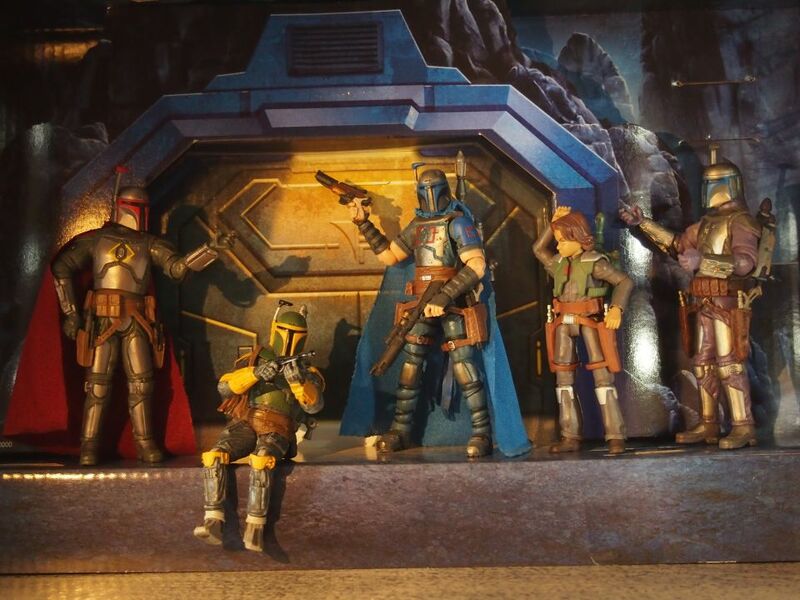 Time to check how lil Boba fits in with other, adult, Mandalorians. Ok, I think that I did what I could to convince those of you who won’t brush this figure off just for being a kid. 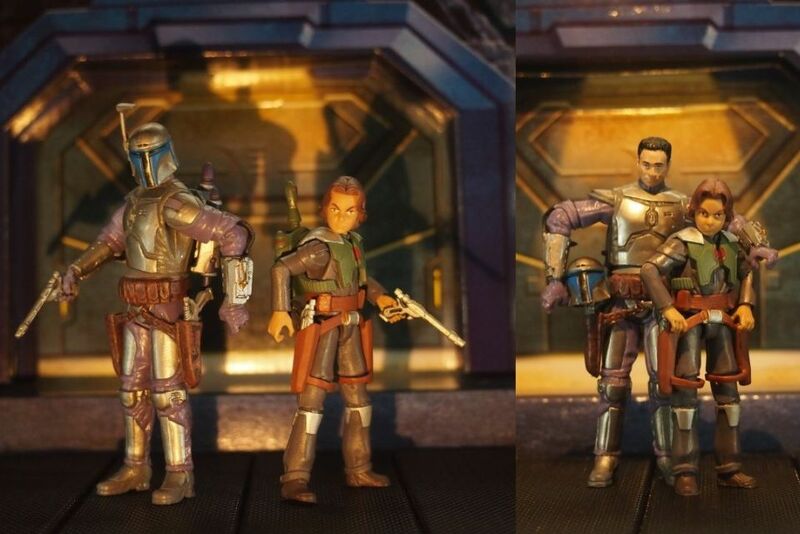 I think it works both as a young Mandalorian learning his trade and a teenage bounty hunter staring his career. It also has some generic uses, considering his face is that of a young Republic clone. 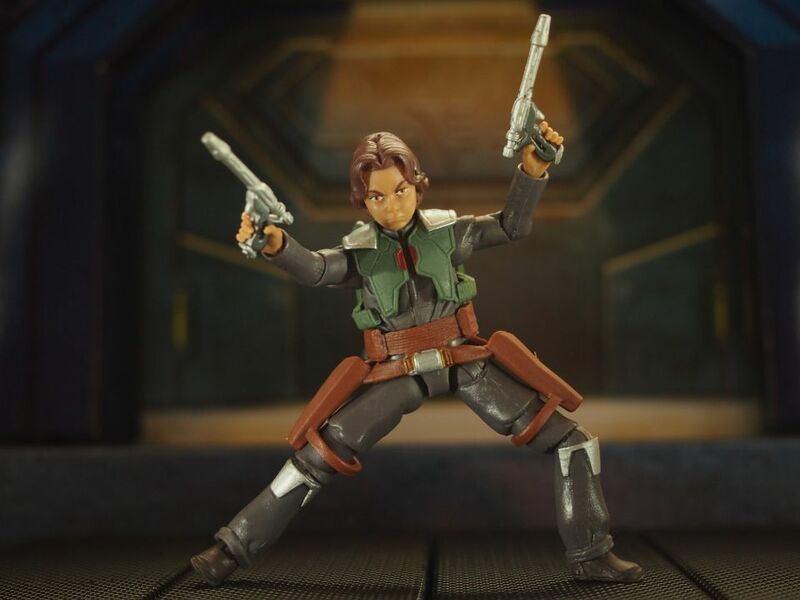 And if you liked Boba in the Clone Wars series and/or in the Attack of the Clones movie then this figure is for sure the best 1:18-scaled version of that character in that time of his life – and I highly doubt they will upgrade him – he’s that good. 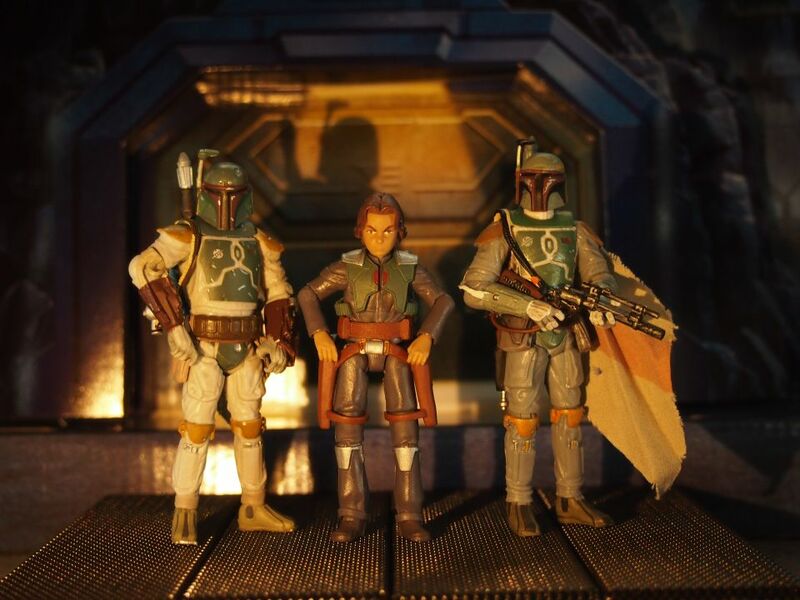 all seeking a young Mandalorian or clone character: customizers, dioramas and dio-stories creators; those who want such a character displayed on their shelf; those who like to play with their figures and need a poseable young Boba for certain scenes and setups. those who are more into a ‘tough and cool’ characters as this IS a figure of a kid, no doubt about it.